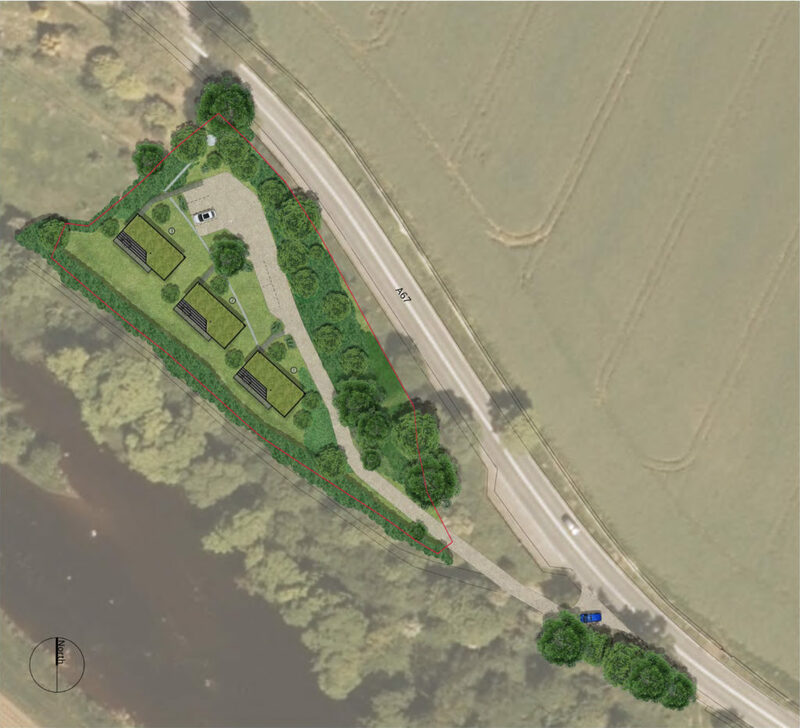 A scheme for three, 2-bedroom holiday lodges on a sloping site overlooking the River Tees between Darlington and Barnard Castle. The site, a triangular plot bounded by the A67 to the North and the river to the South, had formerly been pig pasture. Our clients were keen to develop a scheme that was sympathetic to the local wildlife to enhance the natural setting of the lodges and provide further interest for visitors. Careful and detailed discussions with the local planning authority resulted in approval for our proposals on the basis that local otter, bat and rare butterfly populations would be undisturbed. Our designs carefully positioned the lodges to step down the sloping site from the new entrance so that only the planted roofs of the buildings would be prominent. A wildflower planting mix was specified for the Bauder green roof system to further blend these into the surrounding landscape designed by Jeremy Rye. The untreated larch cladding on the exterior will become silver over time as part of its natural ageing process. The lodges are designed with an L-shaped plan that guarantees views of the river without any obstruction by neighbouring buildings. 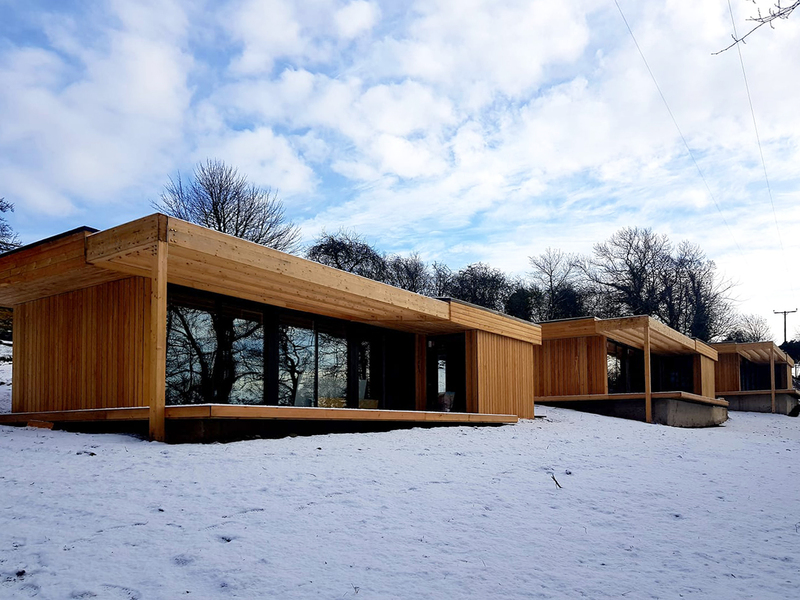 Using a highly insulated timber frame from Lowfield Timber Frames and airtight construction the lodges will achieve exemplary energy efficient. Heating and hot water will be provided by air source heat pump systems. A small wood burning stove provides additional cosiness for colder evenings. Internally the palette of finishes has been selected to complement the natural setting. Polished concrete floors and whitewashed OSB ceilings are offset against oiled timber ‘bookends’ which define the main living space and conceal sliding doors to the bedrooms. The scheme is currently on site with the first lodge expected to be complete in late Spring 2019.